When the 3rd and last batch of Wat Paknam amulets which was chanted by Luang Por Wat Paknam was distributed to lay people. There were still alot of people who wanted to have a Wat PakNam amulet. The disciples of Luang Por Wat Paknam decided to chant another batch of Wat Paknam to cater to the demand of the lay people. 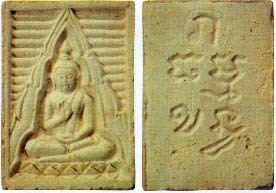 This batch of amulets was called the Roon Tummakan Roon See and created by Luang Por Sod's disciple Pra Tummatirarah Mahah Munee, the then abbot of Wat Paknam after Luang Por Sod had passed away. There were a total of 800,000 pieces amulets created for this 4th batch in BE2514 and was chanted for one rain retreat which is 3 months. The amulets were distributed to lay people on 23th October BE2515. It took more than 10 years for this batch of amulets to be completely distributed in BE2527, because of the vast quantity. This batch of Wat Paknam amulets are very good for klaew Klaht (Protection), Metta (Loving-kindness), Chohk Lahk(Fortune) and Raksah (Blessing). There are many good experiences associated with this 4th batch of Wat Paknam amulets. Though a high amount was created, this batch of amulets are still in high demand for it's blessing and protection. There are a saying that, when one has a Wat Paknam, everything one wish will be fulfilled. Price range from a few thousand bahts to 10,000 bahts depends on pims, colour and condition of the amulet.